"Put your seat belt back on or the police will pull us over and give mommy a ticket!" Oops! Who else has used the police to help emphasize the seriousness of a rule? Guilty here. We also teach our kids that the police are &apos;safe strangers&apos; and to find them if ever in trouble. To help us communicate the latter, our area police departments organize various National Night Out events. Created 32 years ago, these events foster stronger relationships between the police and the communities they serve. The department&apos;s motto for this event must be "Go Big or Go Home." There will be free hot dogs, drinks and snacks. And your kids will have plenty to do with a bounce house, balloons and activities provided by the many vendors. The Avon Police Department is truly taking this time to reach out and educate the public on the many services they provide. They will have a K9 Officer demonstration, will help you sign up your kids for the child ID program and are giving away gun locks. Oh, and the one thing that is sure to get my husband out of the house...a Drone demonstration! And what would a celebration be without prizes? The Avon Police Department has gotten so much support from local businesses that they will give away a prize every 10 minutes including two kids bikes and gift certificates to area stores and restaurants! 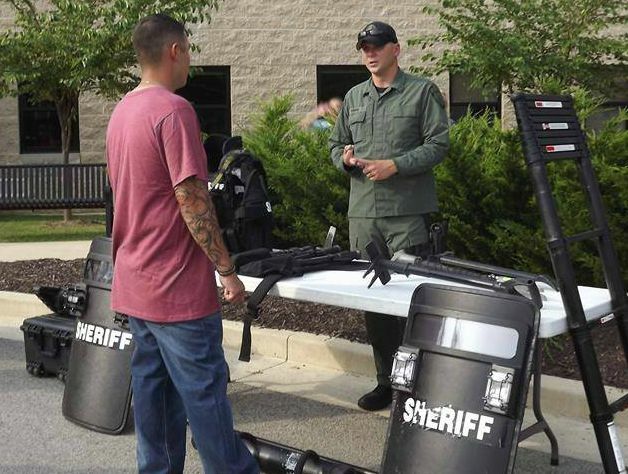 Brownsburg will host activities for the entire family while educating the public about crime and drug prevention. "Big Daddy Caddy" will preform live music while you walk around to vendor booths providing free food and drinks, document shredding, kids ID cards and educational materials on the services their police department provides. For the kids, they were also able to snag the Pacers Fan Van, and because it&apos;s Brownsburg, race cars will be on display. Danville may be known as &apos;modern-day Mayberry,&apos; but the police department realizes there are real life issues taking place in the community. So their celebration will include a documentary at the Royal Theater called "An American Epidemic" that brings awareness to the drastic increase in Heroin and Opiad pain reliever overdoses happening in our neighborhoods. The Danville Police would love your support in going to see this free movie at 5:30 p.m. They also will provide free food and activities like a video game trailer, zip line and inflatables. Did you catch that? A ZIP LINE! Plainfield is in a unique situation because National Night Out is the evening before their public schools start. They aren&apos;t letting that stop them from taking this opportunity to get out into the community though. Saturday they are hosting a small event with food vendors, SWAT vehicles, K9 teams and officers on hand to answer questions. Then on Aug. 4, they will be out in the communities talking to residents. Insider Note: Pittsboro will host their National Night Out in October due to school schedules. We went to this one last year and loved the small-town feel. If you have young kids, it&apos;s perfect to just see the police and emergency vehicles and play at the park. Last year, they also had free food and raffles. My daughter even won tickets to Dinosaur World. Meghan Stritar moved to Hendricks County in 2013 and instantly fell in love with the entire community. She publishes Macaroni Kid - Hendricks and works part-time for Hendricks County Parks and Recreation. She is married with 2 young daughters and their family motto is "Adventure!"